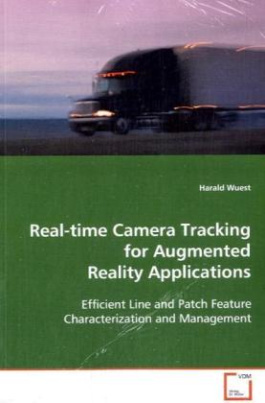 One of the key problems of augmented reality is the§tracking of the camera position and viewing direction§in real-time. Current vision-based systems mostly§rely on the detection and tracking of fiducial§markers. Some markerless approaches exist, which are§based on 3D line models or calibrated reference§images. These methods require a high manual§preprocessing work step, which is not applicable for§the efficient development and design of industrial AR§applications.§The problem of the preprocessing overload is§addressed by the development of vision-based trackingalgorithms, which require a minimal workload of the§preparation of reference data.§§A novel method for the automatic view-dependent§generation of line models in real-time is presented.§The tracking system only needs a polygonal model of a§reference object, which is often available from the§industrial construction process.§§Point-based methods which rely on optical flow-based§template tracking are developed for the camera pose§estimation in partially known scenarios. The§robustness and real-time capability is improved with§a statistical approach for a feature management§system which is based on machine learning techniques.